Karen Chance has put the full synopsis for the INKED anthology on her website so I have updated yesterdays post. 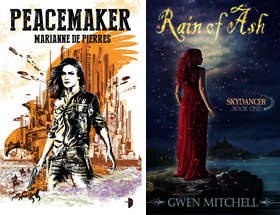 Four tales of urban fantasy and paranormal romance explore body art that is more than it seems—in a world of magic and mayhem that always leaves it mark . . . 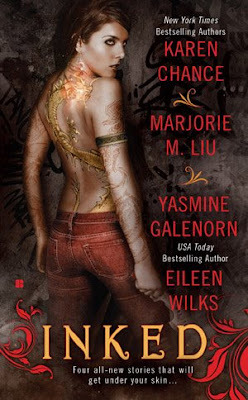 When New York Times bestselling author Marjorie M. Liu's demon slayer Maxine Kiss investigates a grisly murder at a high-class soirée, she finds herself involved in a conspiracy dating back to World War II--and a secret mission that her grandmother may have carried out for the US Government, one that involves the mysterious "Armor of Roses." When the heavily tattooed body of a man is found in a Northern California town, FBI Agent Lily Yu is drawn into the case. Trouble is, the victim wasn't human--and the killer isn't finished in USA Today bestselling author Eileen Wilks's "Human Nature." Great interview over at Vampire Wire! Inked looks great, sounds great - can't wait to take a peek at it.